Thank you very much for supporting Étoiles! We owe everyone for the titles we are recieving. Thank You very much! Hi there again! Another slot challenge has come and it's White Tiger! Yay! This really made me so excited specially when I made a leak about this. I really love cats and tigers since they are just under in the same family. And speaking about family, most of Étoile members has a pet white tiger. So cute *0* And today, we took a picture together with my twin, Mai and our lil sis, Kenzie. Arf~ Hello guys! another premium item today. Chihuahua Gacha. =_= DIDN'T PICO JUST RELEASED AN ITEM YESTERDAY?! WHY ANOTHER ITEM? >:O Can't they let their premium users rest for a while? [NEW] Any color is cute! Chihuahua Gacha!! Hello everyone! It's been a while since we gave an update about VIP. Last MArch 6, 2012, our old page was deleted, reported by someone. We lost our datas and files and one of it is the file of our VIP members. VIP had 150+ members within a short time and we are finding those members starting today. 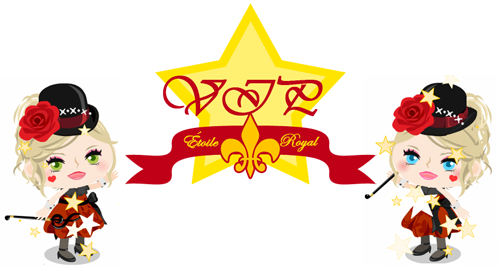 -Send to etoile.royal@yahooo.com through Yahoo, MSN or any other e-mail composer that you are using. Sorry, but this is not yet the time to join VIP. We will be having another announcement so please wait for your turn. As long as possible do not send any e-mail about this if you weren't a member because automatically, it'll be rejected. And as they wanted, we took another group picture but it pink! Yeah, Mai's color :D Mai wasn't able to be there in blue because she went at the Strawberry Park to play gacha and it was too late to stop her. Later, Mai came back and people increased and dressed up in pink. I thought that Mai won't join us because she seems like AFK. But then, she walk beside me and say "Im joining!!" So yeah. This is the last picture we took after that. And yeah, it's been a while since we siblings took picture together and we were with Anna! <3 But actually, when we gathered.. as usual.. They are all SILENT. Yay! My favorite fruit in Gacha! *0* I'm so so so happy! I tried to get the wig today and I spent 1,000AG just for this gacha, but I didn't got any items for closet aside from it's bag. I wanted the wigs! Or even the clothes, I'll be fine! But it gave me bag T0T Oh well, maybe I'll just try next time :( So for those people who will try to get the items they want.. Good luck! I never wanted this. I never wanted a family member who'll quit. But I just can't hold someone's decision but to accept it. Before everything, I explained to her that I don't want her to leave the family because there were circumstances happened few days ago and I don't want her to consider it as a reason to leave her family. But I don't want her to feel she's on hold. I still wanted her to decide for her self. I don't want Étoile will be the reason for her to feel like stucked with something and can't move freely. She'll need this decision not just for her virtual life, but also it's something about personal in Real. 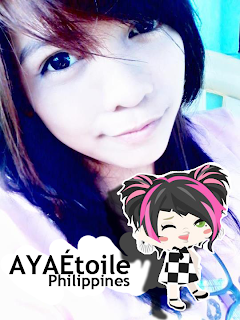 AYA Étoile is officially a non-Étoile. Actually, Aya have been telling me, us that she wants to quit the family whenever something happens negative when it comes about her love life. Some people know what I'm talking about and I just don't want this to be mainstream to people and publish since this is something about her privacy and I don't want to take an action and I don't have the right to say it from me. "Okay then, I'll just quit"
She said. And yeah, it's really a sad thing. I wanted 30 Étoile members now till the Anniversary of the family and didn't expect someone will leave, specially if she's your "Mom" in the family. Yes. Shocking. So yeah, after reading this post. Mainly, I don't want you guys to ask her about why she left the family. I don't want you guys to bother her. Just act normally when you're in front of her and don't ask her about her privacy stuffs. Because whenever she's deciding she'll quit (before), she's receiving A LOT of messages asking her why, what happened.. and who'll be the queen of Étoile if she leave? Well, actually,.. So before this post ends, please check our Family List. So we were in the Black Jack today, I was BJ-ing, Mai was slotting (AFK) and yeah, it was crowded X_X People who came to see us were cheering their friends, Me, Mai and other Étoiles who were there like, Faith, iDomo, Jad, Eric, Ape and others~ and it was so fun because, it's been a while since I played black jack and with Étoiles! YAY! Yeah! And I finished the challenge faster than slot challenge! Sadly, Mai wasn't able to finish it on her first account so she just get it on her other two accounts. Well, she's really fine. Though, she's quite regretting on bbuying 30 30,000 casino chairs total of 900,000C$ yep. Because of that, she had a trouble and got stuck on the 4th challenge. And today, while I was playing,.. she's just slotting to earn c$ for bet later on. Good luck Mai! I'm soooooo disappointed every time Ameba Pico campaigns their other game and in exchange of that, you'll have tokens. FREE TOKENS lol. Of course... tokens are free.. if we buy tokens using AG.. that's legit and it's obviously impossible for us to get tokens through buying Gummies since we get tokens through GM Gacha, right? Just that, won't it make you wonder why Ameba Pico removed daily scratch card, gummy meter and other stuffs? Was the reason was about this? That's... hilarious! Well, I understand that this was for them to campaign their other games but,removing meters and tokens? No way! Until now, I'm so against about it! Because now, to earn gummies we need to find picos who has less props and rings. Hmm, was that because they want us to make friends to other people and spread our selves? -3- I don't find that a reason. [NEW] New Wigs Available in Sakura Bath!! So check them in the farm now! So before this post ends, let me introduce to you the newest family member of ours! [SHOP] New Pet and Pet Items Available!!! !